Emerging fashion, independent design and international talent turned out today at the Sant Pau Art Nouveau Site in the second day of shows of the 080, closed by the guest designer Umit Benan, with his collection “God is black part 2”, with which he has brought his vision in menswear to Barcelona. 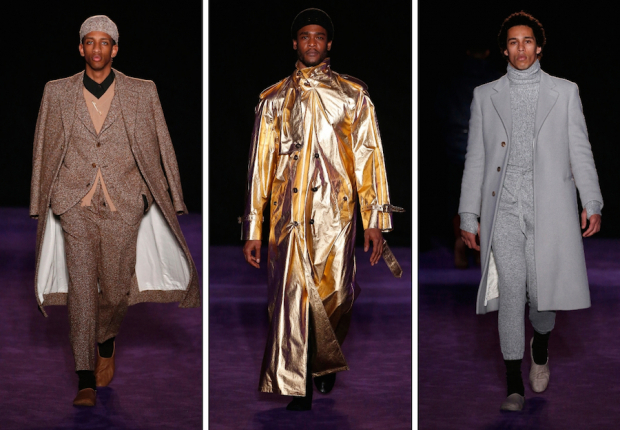 The Turkish designer, as a Muslim living in the Western world, channels the controverisal black Muslim character in this collection through real designs aimed at a real man. Field jackets, loose suits, tailored coats and print kaftans are the key pieces in a man’s wardrobe according to Umit Benan, who has presented the collection to the press earlier in the morning. As he has explained “when we affirm that God is black, for me there is no issue, but I’m aware that it is a statement that arouses reactions and I wanted to delve into the double circumstance that is to be Afroamerican and Muslim”. The young fashion brand Killing Weekend has been in charge to kick off today’s fashion shows schedule with their collection “Zero Year”. Inspired by the setbacks that one can encounter striving for achieving a goal, the proposal was filled with belts and ribbons in black and yellow tones, oversize designs, t-shirts with messages and knit jumpers with their logo. For his part, the twice 080 Emerging Design Award winner Jaime Álvarez has taken the public to a genuine trip to India with his new collection by his brand Mans Concept Menswear. Vibrant colors, Hindu symbols and hand-embroidered fabrics along with laser-cut materials define a collection in earthy hues, as well as navy, lime, fucshia and orange with which he reinvents himself and shows his great creativity and talent to dress the modern man. Z1, the emerging brand by Beatriz Planelles and Matteo de Meo, has been the next on the catwalk with their unisex fashion and their collection “Powered” for autumn-winter 2019-20. Based on sports’ funcionality and exploring innovative techniques like seamless garment technology, they have presented light and contemporary designs with one main color: red. In the afternoon, Txell Miras has opened the runway with a womenswear collection inspired by Il Dottore della peste nera, the doctor of the Black Death. With this original starting point, the Catalan designer has shown a spectacular staging with the models wearing bird-like masks, which reminded of those used by the Renaissance doctors to protect themselves from the plague. Regarding the clothes, hoods, layerings, carabiners and white, black and grey define a collection in which have worked collaborators Alexis Ferrer with the headpieces and Uia with the jewelry. Miriam Ponsa has followed on the 080 Barcelona Fashion catwalk with “The Silk Road”, her collection for autumn-winter 2019-20 inspired by her own nomadic experience through this iconic route to Kirguistan, a country where women are the main axis of the family. In her new designs, Ponsa gets her inspiration through these women and their style, to which she also adds a contemporary flair to represent the duality of her collection. As it’s usual in the Catalan designer, the silhouettes are loose and the looks comfortable, as she presents functional pieces thought for working, as well as for the cold. Volume is applied in the most symbolic designs, like the headpieces and the fabrics worn around the head, a wink to the age when women were healing forces. Before the closure with Umit Benan, it has been the turn of Custo Barcelona, the global Catalan brand that has brought to the 080 “Aftersun”, its see now, buy now collection for spring-summer 2019. It’s a proposal true to its experimental yet comfortable style aimed at a self-assured woman, who seeks to boost her individuality and enjoy the endless summer nights to the max.